Rafting always a good option. Well I have just returned to Taupo after being away for a week or so celebrating yet another birthday. 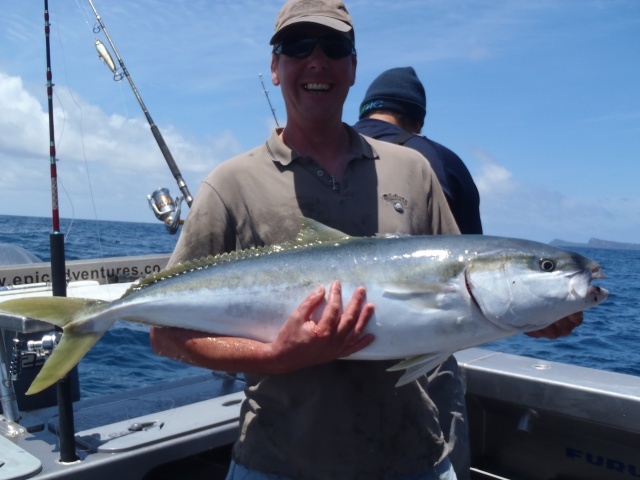 This time I was staying with Paul and Natasha in Tairua which enabled me to do some great sea fishing and diving with Paul. I had a great time getting back in the water chasing crays around rocky ledges and picking up scallops of their sandy beds, something I really miss. We were also able to get some great Snapper, John Dory, Kahwai and some hard fighting Kingfish. I have oftenÂ wondered what the kingies would be like on the fly rod but after being dealt toÂ by big fish while using 100lb braid I have changed my opinion on wishing to try a fly rod. Thank-you Paul and Tash for making my birthday week very enjoyable and relaxed. I have a few days booked on the river this weekÂ using the raft once again which will be good depending on the weather today. 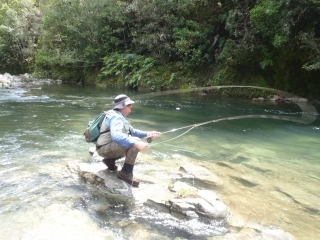 We fished the Whanganui yesterday and floated about 6km of river which I have done alot of guiding on over the past 3Â years and did very well. The weather did not stop raining all day and at times we experienced some solid bursts of wind but this did not put a dampener on the day in which Heather and Richard both caught and lost good numbers of fish. Raft fishing really is aÂ great way to cover plenty of river as it allows you to push past public accessed areas or water which does not look appealing. 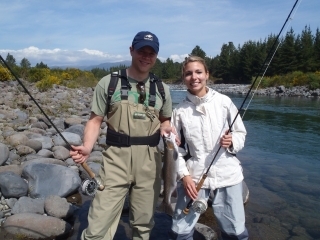 Every pool or run we stopped and fished we caught multiple trout in various sizes while nymphing light natural patterns. Generally I keep things very simple for the Whanganui and stick with famous patterns such as PT nymphs, Hare andÂ Coppers and Quasimodo’s fished below a medium sized front fly for weight, 2 or 3 mm bead will usually be plenty in here. I still stick with a small white indicator most of the time unless I decide to use a thinga ma bobber as someÂ clients seem to cast them easily and they are super reactive to fishy nibbles. This has been a fantastic fishery for a long time now but it will only stay that way if we practice catch and release and keep those fish fit and healthy for years to come. The river was colouring up by the end of yesterday so the next few days might be slightly high out that way. We are back on the upper Tongariro tomorrow which should still haveÂ some trout up high especially asÂ it has had a little rest since the opening week, the rain may also help things. 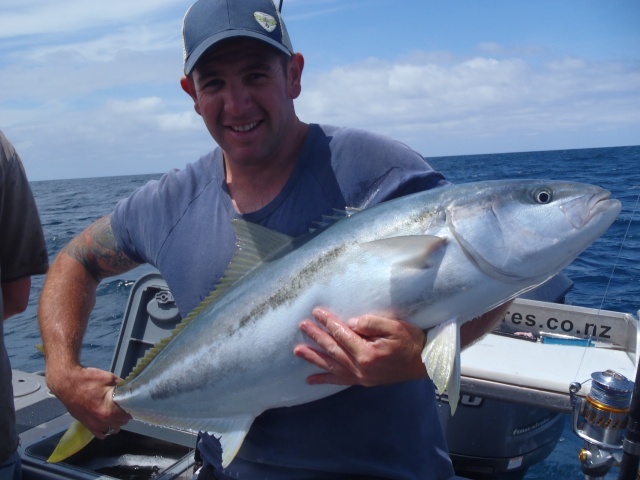 This fishery has not quite fired like it has in the past and most fish seem to be either very high in the section or still very low. I’m not too sure how to explain this one but obviously the spawning has changed slightly in the past few months for these fish to be lower in numbers here. I will still expect a dozen trout or so but a few more will be nice and expected compared to previous years. One thing which does not change on this float is the scenery and the great experience they also get from the raft guide while touching on history of the area and negotiating some hairy looking rapids, it will be a good day. I will check back in the next few days with the results from the rafting on the Tongariro and let you in on any goss which may filter my way Â in regards to fishy tales.